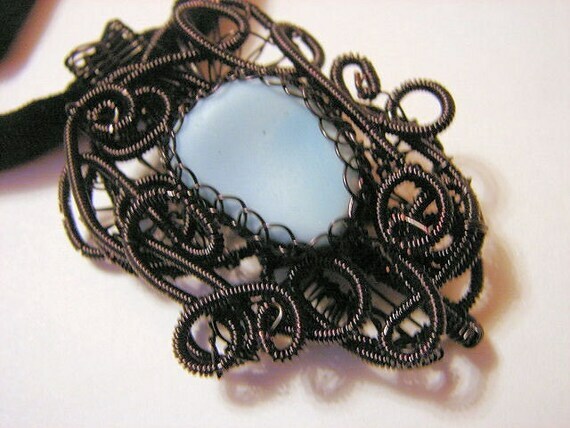 This is one of my new pieces using the great new copper wire. We're back from our Sea Glassin' Trip! We're just back from our latest Sea Glassin' trip--this time in the gorgeous (and warm) Caribbean. We found lots of great sea glass--especially in the Cayman's and I can't wait to get busy with some new designs. I've just completed the set above --keep watching for more! The Sea Glassing Weekend produced little in the way of usable sea glass--as is usually the case on the Mid-Atlantic beaches of NJ, DE and MD--better luck next time. I haven't had time to even look through the few pieces I brought back--it was time to pack up for the Sea Glass Festival. As I looked at the pile in the family room I had serious doubts as to whether it would all fit in the car. We had decided against taking the truck because we were heading to Erie--land of "lake effect snow"
I really thought that Frank was being overly cautious but we decided on the car because of the all wheel drive. Everything fit-we packed the car on Weds. and I started to relax a little. We left for Erie at around 7:30 this morning. We live two miles from the turnpike entrance and it started to rain as soon as we got on. It rained for the whole 285 on the PA turnpike as well as the 123 on rt 79 heading into Erie. Amazingly, there were a few flurries mixed with the rain, the farther North we went. We reached the hotel about 2:30 this afternoon and after checking in, we went out again to explore-neither of us have ever been to the Erie area before. The first thing we did was drive down the road in front of the Hotel-rt 89-to the lake. It was raining but I still hopped out and checked out the beach. I found a few pieces of sea glass as well as some beautiful rocks--I filled a small box with my treasures and then jumped back in the car-out of the rain. We then drove down to the Convention Center to check out where we would need to go to set up tomorrow. We got dinner at the resturant next to the hotel and here I am on the computer. Frank just looked out the window and it is now snowing. The forcast for the area is up to 1-3 inches tonight and again tomorrow night. Thrills!!! I'll let you know how it goes tomorrow--I'm glad we threw in the windshield scraper before we left. Its a beautiful day and just the kind of weather I look forward to--crisp, and clear! We are heading to MD's Eastern Shore for a weekend of R&R and Sea Glassing. Its a little warmer than I would have expected today--80 degrees but with a stiff breeze and lots of sunshine--it will blow away any lingering mosquitoes. We will do some glass hunting here along the bay this afternoon and then tomorrow probably head up to Dewey Beach and a few others nearby --after the morning showers. We took a cruise to Bermuda at the beginning of September. We went by RCL on the Explorer--one of our favorite ships. It was our fourth time on the Explorer--we love that ship because it goes out of Bayonne NJ and we don't need to fly -its an easy 2 hour drive from home. We also love that ship because it goes to Bermuda--a Sea Glass Lover's Paradise!! We arrived in Bermuda early in the morning and we were among the first people off the ship. We took a ferry to St George where we picked up a cab to Alexandra Battery. We could have walked--we have before!--but it was hot and the way is steep. Its about 1 1/2 miles and that wouldn't be so bad but we knew from experience that we would be carrying back a lot of sea glass and it can get really heavy. When we got to the beach, there was hardly anyone there. A few locals with their kids taking an early swim but they were packing up when we arrived. We met two fellows from another cruise ship who arrived right after us--they were snorkling and picking up a little of the glass. We were there roughly two hours and it may seem amazing but in that time we collected 51 pounds of glass--and we were picky! It was low tide and more glass is exposed at that time. The fellows who were snorkling told us that when you are out in the water and your ears are underwater you can hear the glass rolling in the waves.. It is so loud and there is so much it sounds like someone is routing through the silverware drawer in their kitchen. We brought along a nice supply of 1 gallon zip lock bags and as we filled them we placed them in our tote bags. When we were finally ready to leave we called for a cab and headed back to the ferry in St George. Our bags were a little heavy on the walk from the ferry back to the ship and it was really hot that day. When we were going through the security check to get back on the ship, the security crew got a kick out of our "haul"--not many people pick the trash off the beaches and bring over 50 pounds of it home with them!! Can't wait to go back--its really a sea glass paradise. We've spent this afternoon assembling the collection of glass net floats that we will be offering at the Sea Glass Festival. We've been collecting these floats for over 25 years and we have used them as decor in the beach house. The beach house is really, really small and the net floats number over 200--talk about overkill! I decided I would cull the herd-so to speak-and offer some of the bigger floats at the festival. When I was collecting them I never worried about where they were from or anything like that--I liked the color and many of my floats are newer decorative pieces--not just the old authentic net floats. I don't care--I like them all. Most of my large floats--the beachball size are old and signed as are quite a few of the smaller ones. These are the ones I will be offering at the Festival so it will be great pickings for any serious collectors. I have them from Japan (signed and unsigned), Russia, Portugal and Germany, so if net floats are your thing--make sure you stop in and see us at the North American Sea Glass Association Festival, Oct 17 & 18, Bayfront Convention Center, Erie, PA. Of course we will also be showing our sea glass jewelry as well but I'm happy none of these glass floats ever got reduced to the frosted shards but have survived intact after years of floating at sea. I can see the light.....!! Well-the sea glass festival is almost here. As one who never does shows, this has been a challenge. When I finally was sure that I was actually accepted in the festival--June--I began diligently building my inventory so that I would have enough to make a respectable showing. All this in addition to maintaining inventory on the website. During this time of inventory building I have also expanded my interests and "skills"--I have fallen in love with lampworking. As I explained it to my daughter, I feel I have finally come full circle. My interest in beads has been long standing--I've collected antique beads for more than 30 years. When I began making jewelry about 8 years ago, I wouldn't consider including any of my collected beads because I was sure no one but me could appreciate how special they were--why waste them? I guess I still feel that way or maybe I'm just selfish but I still don't want to share any of my collected pieces just yet. The interest in lampworking isn't really new--I've loved each and every lampwork bead in my collection --But I have recently begun to make a few of my own. Very enjoyable and now I have a supply of beads that I can part with as I incorporate them into my sea glass jewelry. My lampwork has taken an exciting turn--I have begun to use sea glass for my lampwork beads. I have used some of the pieces that are not suitable for jewelry--with breaks and unfrosted edges and such. Many of you may not know it but here on the Mid Atlantic Coast, I'm lucky if one piece in 100 is JQ (jewelry quality) The percentage is much better with my glass that I find on Bermuda and Puerto Rico but I still have thousands of pieces of sea glass that I will probably never use for anything. So, now I have found a way to use them. This way I am able to exactly compliment the sea glass used in a jewelry piece with the lampworked beads in exactly the same color. My regular customers have been the first to see the new look and have loved them!! I will be showing these pieces at the Sea Glass Festival later this month but here is a sneak preview.... I'm sure it won't be long before someone else "comes up with" the same idea-just remeber, you saw it here first! !